It features 100 apartments that only Singaporeans aged 55 and above can buy. 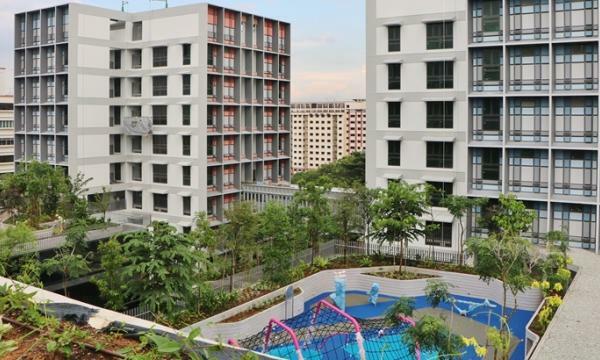 Singapore has rolled out its first publicly-funded retirement village, which co-locates childcare and senior centres in one integrated development. The Kampung Admiralty Project consists of two blocks of 100 apartments. Each flat is equipped with the equipment to help the elderly, and only Singaporeans aged 55 and above are eligible to buy one. "There's also a big community plaza, food outlets, a hawker centre, a medical centre, a supermarket, shops and banks, as well as child and day-care facilities. Above it all, there's a community rooftop garden with a community farm and more than 100 fruit trees. There are activities for the young and for the old and there are spaces for solitary medication and spaces for communal activities," said Liak Teng Lit, the project's co-chair. Singapore is one of many Asian countries facing a "silver tsunami", or the rapid increase in the number of elderly citizens. "By 2030, one in four Singaporeans will be 65 years old or older, with the number of resident seniors expected to have doubled to more than 900,000," said Dr Amy Khor, Senior Minister of State for Health. Data from the Tohoku University's Smart Ageing International Research Center (SAIRC) revealed that there will be 34 super-aged societies in the world by 2030, predominantly in Europe or Asia. These are countries where more than 20% of the population will be over the age of 65. Japan is already an example, with Hong Kong, Singapore, South Korea and Taiwan set to be in the same situation by 2025, whilst [mainland] China and Thailand will not be far behind. Amongst these nations, Singapore is seen as one of the best equipped to weather its own particular silver tsunami. "Our approach has been to increase accessibility to healthcare by adding capacity and enhancing the quality and affordability of care. We have added 1,700 acute hospital beds, 1,200 community hospital beds, 5,300 nursing home beds and expanded our healthcare workforce by 36%," explained Dr. Khor. Singapore also has the facilities to support an additional 4,200 patients in their own residences, as well as the capacity to look after a further 2,900 people through day-care centres.